As the winter drags on in South Dakota, Total Drag provides a much needed escape from the endless cold and near constant cabin fever we all struggle with this time of year. This Pretty Eyes show was exactly what I, and many others in this town, needed to release a lot of weird energy that's been building up during these insanely cold months. There was a decent crowd already gathered in the little record store when the first band, Lemmons, began their set. Immediately deep and heavy guitar riffs filled the space and heads were wildly swinging back and forth as the band opened, Jacob Lemme's vocals evoked a chaotic feeling perfectly matched by the pounding of the drums and fucked up distortion that seemed to be a theme throughout their set. 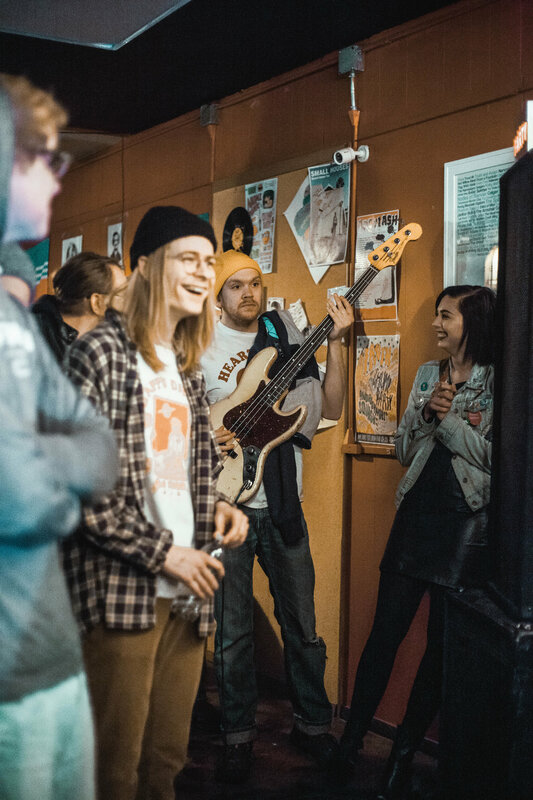 Following up was another rad local band by the name of Bodega Sushi featuring members of other prominent bands in the scene, as well as Dan Nissen, one of the owners of Total Drag, on vocals and drums. Most of Bodega Sushi's set went back and forth between music that took over your mind and had you in a slow sway without even realizing it, to straight bangers that had the whole room headbanging. Finally, our new friends from L.A. off of Castleface records, Prettiest Eyes, took the stage. A dear friend of mine who books the shows at Replay Lounge in Lawrence, KS, had seen them at her venue the night before and sent me a message that morning letting me know this was a can not miss show, so my expectations were pretty high. Prettiest Eyes did not dissapoint, immediately jumping in to chaotic, psychedelic synth punk vibes with loud, echoing vocals that pierced through all thoughts. The bass player left the stage to play in the crowd multiple times while the drummer continuously wailed on the drums and melodically chanted lyrics and screamed out to those gathered, meanwhile I've never seen a keyboard player throw themself into their instrument so wholly. The energy they had on the stage has been matched by very few that I've seen, and it was a beautiful thing to be able to document and experience. Prettiest Eyes is unlike anything I've ever heard and I can't wait to catch them sometime again!